William Thomson, 1st Baron Kelvin, (; 26 June 1824 – 17 December 1907) was a Scots-Irish mathematical physicist and engineer who was born in Belfast in 1824. At the University of Glasgow he did important work in the mathematical analysis of electricity and formulation of the first and second laws of thermodynamics, and did much to unify the emerging discipline of physics in its modern form. He worked closely with mathematics professor Hugh Blackburn in his work. He also had a career as an electric telegraph engineer and inventor, which propelled him into the public eye and ensured his wealth, fame and honour. For his work on the transatlantic telegraph project he was knighted in 1866 by Queen Victoria, becoming Sir William Thomson. He had extensive maritime interests and was most noted for his work on the mariner's compass, which had previously been limited in reliability. Absolute temperatures are stated in units of kelvin in his honour. While the existence of a lower limit to temperature (absolute zero) was known prior to his work, Lord Kelvin is widely known for determining its correct value as approximately −273.15 degree Celsius or −459.67 degree Fahrenheit. He was ennobled in 1892 in recognition of his achievements in thermodynamics, and of his opposition to Irish Home Rule, becoming Baron Kelvin, of Largs in the County of Ayr. He was the first British scientist to be elevated to the House of Lords. The title refers to the River Kelvin, which flows close by his laboratory at the University of Glasgow. His home was the imposing red sandstone mansion Netherhall, in Largs. 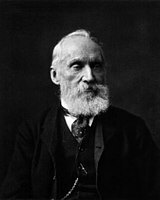 Despite offers of elevated posts from several world-renowned universities Lord Kelvin refused to leave Glasgow, remaining Professor of Natural Philosophy for over 50 years, until his eventual retirement from that post. The Hunterian Museum at the University of Glasgow has a permanent exhibition on the work of Lord Kelvin including many of his original papers, instruments and other artifacts such as his smoking pipe. Always active in industrial research and development, he was recruited around 1899 by George Eastman to serve as vice-chairman of the board of the British company Kodak Limited, affiliated with Eastman Kodak. This article is about Lord Kelvin. For other uses, see Kelvin (disambiguation). For other people with the same name, see William Thomson. William Thomson, 1st Baron Kelvin, OM, GCVO, PC, FRS, FRSE (/ˈkɛlvɪn/; 26 June 1824 – 17 December 1907) was a Scots-Irish mathematical physicist and engineer who was born in Belfast in 1824. At the University of Glasgow he did important work in the mathematical analysis of electricity and formulation of the first and second laws of thermodynamics, and did much to unify the emerging discipline of physics in its modern form. He worked closely with mathematics professor Hugh Blackburn in his work. He also had a career as an electric telegraph engineer and inventor, which propelled him into the public eye and ensured his wealth, fame and honour. For his work on the transatlantic telegraph project he was knighted in 1866 by Queen Victoria, becoming Sir William Thomson. He had extensive maritime interests and was most noted for his work on the mariner's compass, which had previously been limited in reliability. Absolute temperatures are stated in units of kelvin in his honour. While the existence of a lower limit to temperature (absolute zero) was known prior to his work, Lord Kelvin is widely known for determining its correct value as approximately −273.15 degree Celsius or −459.67 degree Fahrenheit. He was ennobled in 1892 in recognition of his achievements in thermodynamics, and of his opposition to Irish Home Rule, becoming Baron Kelvin, of Largs in the County of Ayr. He was the first British scientist to be elevated to the House of Lords. The title refers to the River Kelvin, which flows close by his laboratory at the University of Glasgow. His home was the imposing red sandstone mansion Netherhall, in Largs. Despite offers of elevated posts from several world-renowned universities Lord Kelvin refused to leave Glasgow, remaining Professor of Natural Philosophy for over 50 years, until his eventual retirement from that post. The Hunterian Museum at the University of Glasgow has a permanent exhibition on the work of Lord Kelvin including many of his original papers, instruments and other artifacts such as his smoking pipe. Always active in industrial research and development, he was recruited around 1899 by George Eastman to serve as vice-chairman of the board of the British company Kodak Limited, affiliated with Eastman Kodak. William Thomson's father, James Thomson, was a teacher of mathematics and engineering at Royal Belfast Academical Institution and the son of a farmer. James Thomson married Margaret Gardner in 1817 and, of their children, four boys and two girls survived infancy. Margaret Thomson died in 1830 when William was six years old. William and his elder brother James were tutored at home by their father while the younger boys were tutored by their elder sisters. James was intended to benefit from the major share of his father's encouragement, affection and financial support and was prepared for a career in engineering. In 1832, his father was appointed professor of mathematics at Glasgow and the family moved there in October 1833. The Thomson children were introduced to a broader cosmopolitan experience than their father's rural upbringing, spending mid-1839 in London and the boys were tutored in French in Paris. Mid-1840 was spent in Germany and the Netherlands. Language study was given a high priority. His sister, Anna Thomson, was the mother of James Thomson Bottomley FRSE (1845-1926). Thomson had heart problems and nearly died when he was 9 years old. He attended the Royal Belfast Academical Institution, where his father was a professor in the university department, before beginning study at Glasgow University in 1834 at the age of 10, not out of any precociousness; the University provided many of the facilities of an elementary school for able pupils, and this was a typical starting age. In school, Thomson showed a keen interest in the classics along with his natural interest in the sciences. At the age of 12 he won a prize for translating Lucian of Samosata's Dialogues of the Gods from Latin to English. Thomson became intrigued with Fourier's Théorie analytique de la chaleur and committed himself to study the "Continental" mathematics resisted by a British establishment still working in the shadow of Sir Isaac Newton. Unsurprisingly, Fourier's work had been attacked by domestic mathematicians, Philip Kelland authoring a critical book. The book motivated Thomson to write his first published scientific paper under the pseudonym P.Q.R., defending Fourier, and submitted to the Cambridge Mathematical Journal by his father. A second P.Q.R. paper followed almost immediately. While holidaying with his family in Lamlash in 1841, he wrote a third, more substantial, P.Q.R. paper On the uniform motion of heat in homogeneous solid bodies, and its connection with the mathematical theory of electricity. In the paper he made remarkable connections between the mathematical theories of heat conduction and electrostatics, an analogy that James Clerk Maxwell was ultimately to describe as one of the most valuable science-forming ideas. William's father was able to make a generous provision for his favourite son's education and, in 1841, installed him, with extensive letters of introduction and ample accommodation, at Peterhouse, Cambridge. In 1845 Thomson graduated as Second Wrangler. He also won the First Smith's Prize, which, unlike the tripos, is a test of original research. Robert Leslie Ellis, one of the examiners, is said to have declared to another examiner "You and I are just about fit to mend his pens." While at Cambridge, Thomson was active in sports, athletics and sculling, winning the Colquhoun Sculls in 1843. He also took a lively interest in the classics, music, and literature; but the real love of his intellectual life was the pursuit of science. The study of mathematics, physics, and in particular, of electricity, had captivated his imagination. In 1845, he gave the first mathematical development of Faraday's idea that electric induction takes place through an intervening medium, or "dielectric", and not by some incomprehensible "action at a distance". He also devised the mathematical technique of electrical images, which became a powerful agent in solving problems of electrostatics, the science which deals with the forces between electrically charged bodies at rest. It was partly in response to his encouragement that Faraday undertook the research in September 1845 that led to the discovery of the Faraday effect, which established that light and magnetic (and thus electric) phenomena were related. He was elected a fellow of St. Peter's (as Peterhouse was often called at the time) in June 1845. On gaining the fellowship, he spent some time in the laboratory of the celebrated Henri Victor Regnault, at Paris; but in 1846 he was appointed to the chair of natural philosophy in the University of Glasgow. At twenty-two he found himself wearing the gown of a learned professor in one of the oldest Universities in the country, and lecturing to the class of which he was a first year student but a few years before. By 1847, Thomson had already gained a reputation as a precocious and maverick scientist when he attended the British Association for the Advancement of Science annual meeting in Oxford. At that meeting, he heard James Prescott Joule making yet another of his, so far, ineffective attempts to discredit the caloric theory of heat and the theory of the heat engine built upon it by Sadi Carnot and Émile Clapeyron. Joule argued for the mutual convertibility of heat and mechanical work and for their mechanical equivalence. Thomson was intrigued but sceptical. Though he felt that Joule's results demanded theoretical explanation, he retreated into an even deeper commitment to the Carnot–Clapeyron school. He predicted that the melting point of ice must fall with pressure, otherwise its expansion on freezing could be exploited in a perpetuum mobile. Experimental confirmation in his laboratory did much to bolster his beliefs. In 1848, he extended the Carnot–Clapeyron theory still further through his dissatisfaction that the gas thermometer provided only an operational definition of temperature. He proposed an absolute temperature scale in which a unit of heat descending from a body A at the temperature T° of this scale, to a body B at the temperature (T−1)°, would give out the same mechanical effect [work], whatever be the number T. Such a scale would be quite independent of the physical properties of any specific substance. By employing such a "waterfall", Thomson postulated that a point would be reached at which no further heat (caloric) could be transferred, the point of absolute zero about which Guillaume Amontons had speculated in 1702. "Reflections on the Motive Power of Heat", published by Carnot in French in 1824, the year of Lord Kelvin's birth, used −267 as an estimate of the absolute zero temperature. Thomson used data published by Regnault to calibrate his scale against established measurements. — But a footnote signalled his first doubts about the caloric theory, referring to Joule's very remarkable discoveries. Surprisingly, Thomson did not send Joule a copy of his paper, but when Joule eventually read it he wrote to Thomson on 6 October, claiming that his studies had demonstrated conversion of heat into work but that he was planning further experiments. Thomson replied on 27 October, revealing that he was planning his own experiments and hoping for a reconciliation of their two views. Thomson returned to critique Carnot's original publication and read his analysis to the Royal Society of Edinburgh in January 1849, still convinced that the theory was fundamentally sound. However, though Thomson conducted no new experiments, over the next two years he became increasingly dissatisfied with Carnot's theory and convinced of Joule's. In February 1851 he sat down to articulate his new thinking. However, he was uncertain of how to frame his theory and the paper went through several drafts before he settled on an attempt to reconcile Carnot and Joule. During his rewriting, he seems to have considered ideas that would subsequently give rise to the second law of thermodynamics. In Carnot's theory, lost heat was absolutely lost but Thomson contended that it was "lost to man irrecoverably; but not lost in the material world". Moreover, his theological beliefs led to speculation about the heat death of the universe. I believe the tendency in the material world is for motion to become diffused, and that as a whole the reverse of concentration is gradually going on – I believe that no physical action can ever restore the heat emitted from the Sun, and that this source is not inexhaustible; also that the motions of the Earth and other planets are losing vis viva which is converted into heat; and that although some vis viva may be restored for instance to the earth by heat received from the sun, or by other means, that the loss cannot be precisely compensated and I think it probable that it is under-compensated. Compensation would require a creative act or an act possessing similar power. It is impossible, by means of inanimate material agency, to derive mechanical effect from any portion of matter by cooling it below the temperature of the coldest of the surrounding objects. In the paper, Thomson supported the theory that heat was a form of motion but admitted that he had been influenced only by the thought of Sir Humphry Davy and the experiments of Joule and Julius Robert von Mayer, maintaining that experimental demonstration of the conversion of heat into work was still outstanding. As soon as Joule read the paper he wrote to Thomson with his comments and questions. Thus began a fruitful, though largely epistolary, collaboration between the two men, Joule conducting experiments, Thomson analysing the results and suggesting further experiments. The collaboration lasted from 1852 to 1856, its discoveries including the Joule–Thomson effect, sometimes called the Kelvin–Joule effect, and the published results did much to bring about general acceptance of Joule's work and the kinetic theory. Thomson published more than 650 scientific papers and applied for 70 patents (not all were issued). Regarding science, Thomson wrote the following. In physical science a first essential step in the direction of learning any subject is to find principles of numerical reckoning and practicable methods for measuring some quality connected with it. I often say that when you can measure what you are speaking about and express it in numbers you know something about it; but when you cannot measure it, when you cannot express it in numbers, your knowledge is of a meagre and unsatisfactory kind: it may be the beginning of knowledge, but you have scarcely, in your thoughts, advanced to the stage of science, whatever the matter may be. To understand the technical issues in which Thomson became involved, see Submarine communications cable: Bandwidth problems. Though now eminent in the academic field, Thomson was obscure to the general public. In September 1852, he married childhood sweetheart Margaret Crum, daughter of Walter Crum; but her health broke down on their honeymoon and, over the next seventeen years, Thomson was distracted by her suffering. On 16 October 1854, George Gabriel Stokes wrote to Thomson to try to re-interest him in work by asking his opinion on some experiments of Michael Faraday on the proposed transatlantic telegraph cable. Faraday had demonstrated how the construction of a cable would limit the rate at which messages could be sent – in modern terms, the bandwidth. Thomson jumped at the problem and published his response that month. He expressed his results in terms of the data rate that could be achieved and the economic consequences in terms of the potential revenue of the transatlantic undertaking. In a further 1855 analysis, Thomson stressed the impact that the design of the cable would have on its profitability. Thomson contended that the signalling speed through a given cable was inversely proportional to the square of the length of the cable. Thomson's results were disputed at a meeting of the British Association in 1856 by Wildman Whitehouse, the electrician of the Atlantic Telegraph Company. Whitehouse had possibly misinterpreted the results of his own experiments but was doubtless feeling financial pressure as plans for the cable were already well under way. He believed that Thomson's calculations implied that the cable must be "abandoned as being practically and commercially impossible." Thomson attacked Whitehouse's contention in a letter to the popular Athenaeum magazine, pitching himself into the public eye. Thomson recommended a larger conductor with a larger cross section of insulation. However, he thought Whitehouse no fool and suspected that he might have the practical skill to make the existing design work. Thomson's work had, however, caught the eye of the project's undertakers and in December 1856, he was elected to the board of directors of the Atlantic Telegraph Company. Thomson became scientific adviser to a team with Whitehouse as chief electrician and Sir Charles Tilston Bright as chief engineer but Whitehouse had his way with the specification, supported by Faraday and Samuel F. B. Morse. Thomson sailed on board the cable-laying ship HMS Agamemnon in August 1857, with Whitehouse confined to land owing to illness, but the voyage ended after 380 miles (610 km) when the cable parted. Thomson contributed to the effort by publishing in the Engineer the whole theory of the stresses involved in the laying of a submarine cable, and showed that when the line is running out of the ship, at a constant speed, in a uniform depth of water, it sinks in a slant or straight incline from the point where it enters the water to that where it touches the bottom. Thomson developed a complete system for operating a submarine telegraph that was capable of sending a character every 3.5 seconds. He patented the key elements of his system, the mirror galvanometer and the siphon recorder, in 1858. Whitehouse still felt able to ignore Thomson's many suggestions and proposals. It was not until Thomson convinced the board that using purer copper for replacing the lost section of cable would improve data capacity, that he first made a difference to the execution of the project. The board insisted that Thomson join the 1858 cable-laying expedition, without any financial compensation, and take an active part in the project. In return, Thomson secured a trial for his mirror galvanometer, about which the board had been unenthusiastic, alongside Whitehouse's equipment. However, Thomson found the access he was given unsatisfactory and the Agamemnon had to return home following the disastrous storm of June 1858. Back in London, the board was on the point of abandoning the project and mitigating their losses by selling the cable. Thomson, Cyrus West Field and Curtis M. Lampson argued for another attempt and prevailed, Thomson insisting that the technical problems were tractable. Though employed in an advisory capacity, Thomson had, during the voyages, developed a real engineer's instincts and skill at practical problem-solving under pressure, often taking the lead in dealing with emergencies and being unafraid to lend a hand in manual work. A cable was finally completed on 5 August. Thomson's fears were realized when Whitehouse's apparatus proved insufficiently sensitive and had to be replaced by Thomson's mirror galvanometer. Whitehouse continued to maintain that it was his equipment that was providing the service and started to engage in desperate measures to remedy some of the problems. He succeeded only in fatally damaging the cable by applying 2,000 V. When the cable failed completely Whitehouse was dismissed, though Thomson objected and was reprimanded by the board for his interference. Thomson subsequently regretted that he had acquiesced too readily to many of Whitehouse's proposals and had not challenged him with sufficient energy. A joint committee of inquiry was established by the Board of Trade and the Atlantic Telegraph Company. Most of the blame for the cable's failure was found to rest with Whitehouse. The committee found that, though underwater cables were notorious in their lack of reliability, most of the problems arose from known and avoidable causes. Thomson was appointed one of a five-member committee to recommend a specification for a new cable. The committee reported in October 1863. In July 1865, Thomson sailed on the cable-laying expedition of the SS Great Eastern but the voyage was again dogged by technical problems. The cable was lost after 1,200 miles (1,900 km) had been laid and the expedition had to be abandoned. A further expedition in 1866 managed to lay a new cable in two weeks and then go on to recover and complete the 1865 cable. The enterprise was now feted as a triumph by the public and Thomson enjoyed a large share of the adulation. Thomson, along with the other principals of the project, was knighted on 10 November 1866. To exploit his inventions for signalling on long submarine cables, Thomson now entered into a partnership with C.F. Varley and Fleeming Jenkin. In conjunction with the latter, he also devised an automatic curb sender, a kind of telegraph key for sending messages on a cable. Thomson took part in the laying of the French Atlantic submarine communications cable of 1869, and with Jenkin was engineer of the Western and Brazilian and Platino-Brazilian cables, assisted by vacation student James Alfred Ewing. He was present at the laying of the Pará to Pernambuco section of the Brazilian coast cables in 1873. Thomson's wife had died on 17 June 1870 and he resolved to make changes in his life. Already addicted to seafaring, in September he purchased a 126 ton schooner, the Lalla Rookh and used it as a base for entertaining friends and scientific colleagues. His maritime interests continued in 1871 when he was appointed to the board of enquiry into the sinking of the HMS Captain. In June 1873, Thomson and Jenkin were on board the Hooper, bound for Lisbon with 2,500 miles (4,020 km) of cable when the cable developed a fault. An unscheduled 16-day stop-over in Madeira followed and Thomson became good friends with Charles R. Blandy and his three daughters. On 2 May 1874 he set sail for Madeira on the Lalla Rookh. As he approached the harbour, he signalled to the Blandy residence "Will you marry me?" and Fanny signalled back "Yes". Thomson married Fanny, 13 years his junior, on 24 June 1874. Over the period 1855 to 1867, Thomson collaborated with Peter Guthrie Tait on a text book that founded the study of mechanics first on the mathematics of kinematics, the description of motion without regard to force. The text developed dynamics in various areas but with constant attention to energy as a unifying principle. A second edition appeared in 1879, expanded to two separately bound parts. The textbook set a standard for early education in mathematical physics. Between 1870 and 1890 a theory purporting that an atom was a vortex in the ether was immensely popular among British physicists and mathematicians. About 60 scientific papers were written by around 25 scientists. Following the lead of Thomson and Tait, the branch of topology called knot theory was developed. Kelvin's initiative in this complex study that continues to inspire new mathematics has led to persistence of the topic in history of science. Thomson was an enthusiastic yachtsman, his interest in all things relating to the sea perhaps arising from, or at any rate fostered by, his experiences on the Agamemnon and the Great Eastern. Thomson introduced a method of deep-sea sounding, in which a steel piano wire replaces the ordinary hand line. The wire glides so easily to the bottom that "flying soundings" can be taken while the ship is going at full speed. A pressure gauge to register the depth of the sinker was added by Thomson. About the same time he revived the Sumner method of finding a ship's place at sea, and calculated a set of tables for its ready application. He also developed a tide predicting machine. During the 1880s, Thomson worked to perfect the adjustable compass in order to correct errors arising from magnetic deviation owing to the increasing use of iron in naval architecture. Thomson's design was a great improvement on the older instruments, being steadier and less hampered by friction, the deviation due to the ship's own magnetism being corrected by movable masses of iron at the binnacle. Thomson's innovations involved much detailed work to develop principles already identified by George Biddell Airy and others but contributed little in terms of novel physical thinking. Thomson's energetic lobbying and networking proved effective in gaining acceptance of his instrument by The Admiralty. Scientific biographers of Thomson, if they have paid any attention at all to his compass innovations, have generally taken the matter to be a sorry saga of dim-witted naval administrators resisting marvellous innovations from a superlative scientific mind. Writers sympathetic to the Navy, on the other hand, portray Thomson as a man of undoubted talent and enthusiasm, with some genuine knowledge of the sea, who managed to parlay a handful of modest ideas in compass design into a commercial monopoly for his own manufacturing concern, using his reputation as a bludgeon in the law courts to beat down even small claims of originality from others, and persuading the Admiralty and the law to overlook both the deficiencies of his own design and the virtues of his competitors'. The truth, inevitably, seems to lie somewhere between the two extremes. Charles Babbage had been among the first to suggest that a lighthouse might be made to signal a distinctive number by occultations of its light but Thomson pointed out the merits of the Morse code for the purpose, and urged that the signals should consist of short and long flashes of the light to represent the dots and dashes. Thomson did more than any other electrician up to his time in introducing accurate methods and apparatus for measuring electricity. As early as 1845 he pointed out that the experimental results of William Snow Harris were in accordance with the laws of Coulomb. In the Memoirs of the Roman Academy of Sciences for 1857 he published a description of his new divided ring electrometer, based on the old electroscope of Johann Gottlieb Friedrich von Bohnenberger and he introduced a chain or series of effective instruments, including the quadrant electrometer, which cover the entire field of electrostatic measurement. He invented the current balance, also known as the Kelvin balance or Ampere balance (SiC), for the precise specification of the ampere, the standard unit of electric current. From around 1880 he was aided by the electrical engineer Magnus Maclean FRSE in his electrical experiments. In 1893, Thomson headed an international commission to decide on the design of the Niagara Falls power station. Despite his belief in the superiority of direct current electric power transmission, he endorsed Westinghouse's alternating current system which had been demonstrated at the Chicago World's Fair of that year. Even after Niagara Falls Thomson still held to his belief that direct current was the superior system. Acknowledging his contribution to electrical standardisation, the International Electrotechnical Commission elected Thomson as its first President at its preliminary meeting, held in London on 26–27 June 1906. "On the proposal of the President [Mr Alexander Siemens, Great Britain], secounded [sic] by Mr Mailloux [US Institute of Electrical Engineers] the Right Honorable Lord Kelvin, G.C.V.O., O.M., was unanimously elected first President of the Commission", minutes of the Preliminary Meeting Report read. Thomson remained a devout believer in Christianity throughout his life; attendance at chapel was part of his daily routine. He saw his Christian faith as supporting and informing his scientific work, as is evident from his address to the annual meeting of the Christian Evidence Society, 23 May 1889. One of the clearest instances of this interaction is in his estimate of the age of the Earth. Given his youthful work on the figure of the Earth and his interest in heat conduction, it is no surprise that he chose to investigate the Earth's cooling and to make historical inferences of the Earth's age from his calculations. Thomson was a creationist in a broad sense, but he was not a 'flood geologist'. He contended that the laws of thermodynamics operated from the birth of the universe and envisaged a dynamic process that saw the organisation and evolution of the solar system and other structures, followed by a gradual "heat death". He developed the view that the Earth had once been too hot to support life and contrasted this view with that of uniformitarianism, that conditions had remained constant since the indefinite past. He contended that "This earth, certainly a moderate number of millions of years ago, was a red-hot globe ... ."
After the publication of Charles Darwin's On the Origin of Species in 1859, Thomson saw evidence of the relatively short habitable age of the Earth as tending to contradict Darwin's gradualist explanation of slow natural selection bringing about biological diversity. Thomson's own views favoured a version of theistic evolution sped up by divine guidance. His calculations showed that the Sun could not have possibly existed long enough to allow the slow incremental development by evolution – unless some energy source beyond what he or any other Victorian era person knew of was found. He was soon drawn into public disagreement with geologists, and with Darwin's supporters John Tyndall and T.H. Huxley. In his response to Huxley's address to the Geological Society of London (1868) he presented his address "Of Geological Dynamics", (1869) which, among his other writings, challenged the geologists' acceptance that the earth must be of indefinite age. Thomson's initial 1864 estimate of the Earth's age was from 20 to 400 million years old. These wide limits were due to his uncertainty about the melting temperature of rock, to which he equated the earth's interior temperature, as well as the uncertainty in thermal conductivities and specific heats of rocks, Over the years he refined his arguments and reduced the upper bound by a factor of ten, and in 1897 Thomson, now Lord Kelvin, ultimately settled on an estimate that the Earth was 20–40 million years old. In a letter published in Scientific American Supplement 1895 Kelvin criticized geologist’s estimates of the age of rocks and the age of the earth, like estimates of Charles Darwin, as “vaguely vast age”. His exploration of this estimate can be found in his 1897 address to the Victoria Institute, given at the request of the Institute's president George Stokes, as recorded in that Institute's journal Transactions. Although his former assistant John Perry published a paper in 1895 challenging Kelvin's assumption of low thermal conductivity inside the Earth, and thus showing a much greater age, this had little immediate impact. The discovery in 1903 that radioactive decay releases heat led to Kelvin's estimate being challenged, and Ernest Rutherford famously made the argument in a lecture attended by Kelvin that this provided the unknown energy source Kelvin had suggested, but the estimate was not overturned until the development in 1907 of radiometric dating of rocks. It was widely believed that the discovery of radioactivity had invalidated Thomson's estimate of the age of the Earth. Thomson himself never publicly acknowledged this because he thought he had a much stronger argument restricting the age of the Sun to no more than 20 million years. Without sunlight, there could be no explanation for the sediment record on the Earth's surface. At the time, the only known source for the solar power output was gravitational collapse. It was only when thermonuclear fusion was recognised in the 1930s that Thomson's age paradox was truly resolved. In the winter of 1860–1861 Kelvin slipped on some ice and fractured his leg, causing him to limp thereafter. He remained something of a celebrity on both sides of the Atlantic until his death. In the 1902 Coronation Honours list published on 26 June 1902 (the original day of King Edward VII´s coronation), Lord Kelvin was appointed a Privy Counsellor and one of the first members of the new Order of Merit (OM). He received the order from the King on 8 August 1902, and was sworn a member of the council at Buckingham Palace on 11 August 1902. In November 1907 he caught a chill and his condition deteriorated until he died at his Scottish residence, Netherhall, in Largs on 17 December. Lord Kelvin was an elder of St Columba's Parish Church (Church of Scotland) in Largs for many years. It was to that church that his remains were taken after his death at Largs on 17 December 1907. Following the funeral service there, the body was taken to Bute Hall in his beloved University of Glasgow for a service of remembrance before the body was taken to London for interment at Westminster Abbey, near the final resting place of Sir Isaac Newton. It should be noted, however, that Thompson's biography of Kelvin makes no mention of his eldership at St. Columba's, Largs, or a funeral service there, but rather that "whenever he was at Largs he attended there the services of the Free Church [of Scotland], of which his wife's brother-in-law, the Rev. Charles Watson, was minister." William is also memorialised on the Thomson family grave in Glasgow Necropolis. The family grave has a second modern memorial to William alongside, erected by the Royal Philosophical Society of Glasgow. In 1884, Thomson led a master class on "Molecular Dynamics and the Wave Theory of Light" at Johns Hopkins University. Kelvin referred to the acoustic wave equation describing sound as waves of pressure in air and attempted to describe also an electromagnetic wave equation, presuming a luminiferous aether susceptible to vibration. The study group included Michelson and Morley who subsequently performed the Michelson-Morley experiment that undercut the aether theory. Thomson did not provide a text but A. S. Hathaway took notes and duplicated them with a Papyrograph. As the subject matter was under active development, Thomson amended that text and in 1904 it was typeset and published. Thomson's attempts to provide mechanical models ultimately failed in the electromagnetic regime. On 27 April 1900 he gave a widely reported lecture titled Nineteenth-Century Clouds over the Dynamical Theory of Heat and Light to the Royal Institution. The two "dark clouds" he was alluding to were confusion surrounding how matter moves through the aether (including the puzzling results of the Michelson–Morley experiment) and indications that the Law of Equipartition in statistical mechanics might break down. Two major physical theories were developed during the twentieth century starting from these issues: for the former, the theory of relativity; for the second, quantum mechanics. Albert Einstein, in 1905, published the so-called "Annus Mirabilis papers", one of which explained the photoelectric effect and was a precursor of quantum mechanics, another of which described special relativity. Like many scientists, Thomson made some mistakes in predicting the future of technology. His forecast for practical aviation (i.e., heavier-than-air aircraft) was negative. In 1896 he refused an invitation to join the Aeronautical Society, writing that "I have not the smallest molecule of faith in aerial navigation other than ballooning or of expectation of good results from any of the trials we hear of." And in a 1902 newspaper interview he predicted that "No balloon and no aeroplane will ever be practically successful." The statement "There is nothing new to be discovered in physics now. All that remains is more and more precise measurement" has been widely misattributed to Kelvin since the 1980s, either without citation or stating that it was made in an address to the British Association for the Advancement of Science (1900). There is no evidence that Kelvin said this, and the quote is instead a paraphrase of Albert A. Michelson, who in 1894 stated: "… it seems probable that most of the grand underlying principles have been firmly established … An eminent physicist remarked that the future truths of physical science are to be looked for in the sixth place of decimals." Similar statements were given earlier by others, such as Philipp von Jolly. The attribution to Kelvin giving an address in 1900 is presumably a confusion with his "Two clouds" speech, delivered to the Royal Institution in 1900 (see above), and which on the contrary pointed out areas that would subsequently see revolutions. In 1898, Kelvin predicted that only 400 years of oxygen supply remained on the planet, due to the rate of burning combustibles. In his calculation, Kelvin assumed that photosynthesis was the only source of free oxygen; he did not know all of the components of the oxygen cycle. [dubious – discuss] He could not even have known all of the sources of photosynthesis: for example the cyanobacterium Prochlorococcus—which accounts for more than half of marine photosynthesis—was not discovered until 1986. Fellow of the Royal Society of Edinburgh, 1847. Gunning Victoria Jubilee Prize, 1887. Foreign member of the Royal Swedish Academy of Sciences, 1851. Fellow of the Royal Society, 1851. Hon. Member of the Royal College of Preceptors (College of Teachers), 1858. Hon. Member of the Institution of Engineers and Shipbuilders in Scotland, 1859. Commander of the Imperial Order of the Rose (Brazil), 1873. Commander of the Legion of Honor (France), 1881. Grand Officer of the Legion of Honor, 1889. Knight of the Prussian Order Pour le Mérite, 1884. Commander of the Order of Leopold (Belgium), 1890. Baron Kelvin, of Largs in the County of Ayr, 1892. The title derives from the River Kelvin, which runs by the grounds of the University of Glasgow. His title died with him, as he was survived by neither heirs nor close relations. Knight Grand Cross of the Victorian Order, 1896. Honorary degree Legum doctor (LL.D. ), University of Yale, 5 May 1902. One of the first members of the Order of Merit, 1902. Privy Counsellor, 11 August 1902. First international recipient of John Fritz Medal, 1905. Order of the First Class of the Sacred Treasure of Japan, 1901. He is buried in Westminster Abbey, London next to Isaac Newton. Lord Kelvin was commemorated on the £20 note issued by the Clydesdale Bank in 1971; in the current issue of banknotes, his image appears on the bank's £100 note. He is shown holding his adjustable compass and in the background is a map of the transatlantic cable. The town of Kelvin, Arizona, is named in his honour, as he was reputedly a large investor in the mining operations there. In 2011 he was one of seven inaugural inductees to the Scottish Engineering Hall of Fame. A cubit arm erect, vested azure, cuffed argent, the hand grasping five ears of rye proper. Argent a stag's head caboshed gules, on a chief azure a thunderbolt proper, winged or, between two spur revels of the first. On the dexter side a student of the University of Glasgow, habited, holding in his dexter hand a marine voltmeter, all proper. On the sinister side a sailor, habited, holding in the dexter hand a coil, the rope passing through the sinister, and suspended therefrom a sinker of a sounding machine, also all proper.